Dar es Salaam. The daily sitting allowance for an MP has been increased by more close to over 285.7 per cent, The Citizen has been reliably informed. Some sources who attended the just-ended fifth Parliament told this paper that the amount has gone up by almost three times – from Sh70,000 to a whopping Sh200,000 per day. The latest adjustment has effectively increased the amount of cash that goes to a legislator pocket daily during a Bunge session to Sh330,000 because, besides the Sh200,000 for sitting, they also receive a per diem of Sh80,000 plus Sh50,000 for fuel. However, when contacted, Clerk of the National Assembly Thomas Kashillila said his office was not aware of the said increase. “I understand there was talk among MPs to have their allowances raised, but if that has been effected, my office hasn’t been formally informed yet. Therefore, I cannot confirm that MPs’ allowances have gone up,” he said over his mobile phone yesterday. Dr Kashillila advised The Citizen to check up with the Speaker of the National Assembly Anne Makinda or her deputy, Mr Job Ndugai, for a precise response but our efforts were in vain for the two officials’ phones were not reachable despite repeated attempts. Though many MPs who attended the just- ended Parliament session were hesitant to comment on the matter, impeccable sources confirmed to this paper that the sitting allowances have nearly tripled. 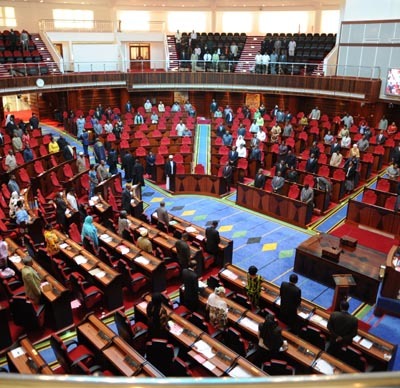 The MPs’ hesitation to comment on the raise could be on account of uneasiness stemming from the recent debate in which the opposition Chadema pressed for abolition of sitting allowances for the lawmakers. When contacted, the Leader of Official Opposition in the Parliament, Mr Freeman Mbowe, saidthe latest raise clearly showed that the government has not taken note of Chadema’s sentiments over allowances. He maintained that his party’s stand over allowances should not be personalised as it was national resources that are being used to overpay a few individuals while the majority of Tanzanians languished in abject poverty. Mr Mbowe said personally, he would not know for certain that there has been a rise in sitting allowances for MPs since he doesn’t collect his. “Maybe the new allowances were discussed in the House at the time I was attending my cases in Arusha… I was only present during a few sessions towards the end of the debate on the Constitutional Review Act Bill,” he said. The increase in MPs’ allowance comes at a time when the majority of ordinary Tanzanians are lamenting over the cost of living against their frozen incomes. Hardships for the mwananchi are reflected on the two-digit inflation which at the moment stands at around 17.9 per cent as announced by the National Bureau of Statistics (NBS) recently. The decision to increase MPs’ sitting allowance is also said to contradict the government’s five years development plan, unveiled mid this year, one of whose agenda was to reduce allowances. Prime Minister Mizengo Pinda is also on record as telling the Parliament during the Budget session that the government had agreed to a proposal to slash allowances. When contacted, Felix Mkosamali (Kibondo-NCCR Mgeuzi) and Rev Peter Msigwa (Iringa Urban – Chadema) declined to discuss the matter in detail and said MPs have not been officially informed of the decision to increase their sitting allowances. “I have not received any letter informing me that my allowance has been increased. I will inquire and once I get a categorical answer I will make my stand over this issue known,” said Mr Mkosamali. But Deo Filikunjombe (Ludewa-CCM) said the raised allowance was justifiable given the meagre salaries paid to lawmakers. “And my stand is that if MPs were being paid in accordance with the weight of their job, there would be no need to pay them hefty allowances and this is not for MPs only. Civil servants too receive very small salaries,” he said. In June this year, the Deputy Leader of the Opposition in the Parliament, Mr Zitto Kabwe, presented a letter in which he rejected his sitting allowance on the grounds that MPs were not supposed to be paid for sitting, arguing that their job, for which they receive monthly salaries, is to sit at the Bunge and debate. Mr Kabwe’s stand, however, drew stiff opposition from a majority of the MPs, including some from his own party.